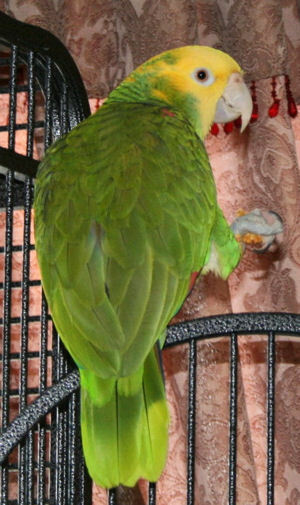 Patrek is a Double Yellow Headed Amazon approximately 4-6 years old. I received him (tested and yep a HIM thankfully) as a foster to adopt in March of this year. He came as a one owner bird and was placed in the program due to the owners� death. The first few days in my house Patrek was quiet as sin. He never made a single noise. I kept forgetting his original name (Foghorn Longhorn) so I referred to him as bird till he referred to himself as Patrek and thus his name. I will never forget his first words to me as I was talking to him as I do. I made a stupid remark and heard in response "You LIAR!" Whipping around (because I hate that word) "pardon me bird". He laughed a hearty old lady laugh and said "Patrek is a big boy!" Patrek has a very big vocabulary from "time to go to work�, �see you later I love you". Every day as I leave, to "hi Nat how are you *laughing*" to everyday as I get home. He uses no profanity for now. He plays telephone and wolf whistles most of the day back and forth with my Quaker Basil. His favorite food is Nutriberries and Yo-yo Dips. I feed him a fruit pellet diet and a little of this and that from my meals, if he doesn�t scream at all while I am eating (he used to wail whenever he saw food or people eating). He hates carrots and water chestnuts. 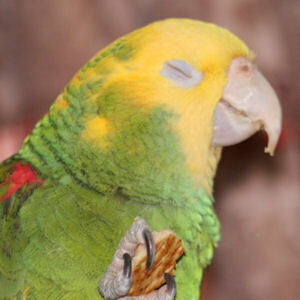 Oh yeah, oh YEAH...that's gooood cracker! Let me share a little bit of information about Amazons. 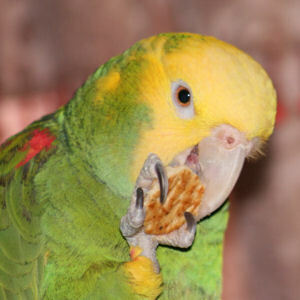 They are a loving, sociable parrot from South America. Their love, affection and loyal nature make them a wonderful pet for anyone with large bird experience. Being very intelligent they require time from an owner willing to give them a lot of attention and stimulate them with toys. "Experts" say hand reared males are the best pets. Easily trained they can gain an excellent vocabulary or mimic sounds quite well. For Amazons not stimulated, trained or socialized they may become aggressive and become burdened with behavioral issues. In the wild they range from South America, Mexico to the Caribbean. Their native foods are nuts, fruits and leaves from trees. Most Amazons are primarily green with accenting colors that can be very stunning. Being owned by an Amazon is a lot like having an active two-year-old living with you. Their average life span is 50+ years. Amazons are not for everybody and research should be done before making a commitment that you live with for that many years.